Director Sam Esmail (third from left) and cinematographer Tod Campbell (wearing knit cap) study a setup. The set was devised to accommodate a 73' Chapman/Leonard Hydrascope Telescopic Crane, which today is taking the camera through virtually the entire length of the custom build as the filmmakers capture the set-based elements of a four-part, three-stitch shot. The Hydrascope starts out traveling from Heidi’s office and follows her all the way to the cafeteria. From there, a SpaceCam Oculus head, provided by CineMoves, on a Chapman Pee Wee dolly seamlessly takes over the sequence and continues following her through the cafeteria and dorm rooms, and then out a door. “When Sam first approached me about this show and we started hashing out ideas together, one of the first things he wanted to discuss was doing the big oner to introduce Heidi, the set and the facility,” Campbell explains. 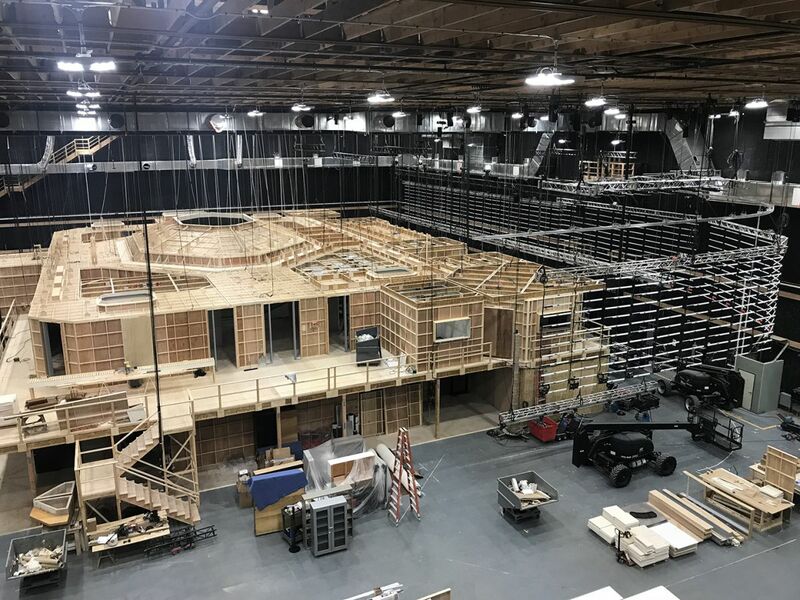 “In the earliest stages, he said he wanted to be able to pull the entire ceiling off this 24,000-square-foot set and fly the camera over the top of it. We wanted that 73' crane to be able to essentially reach every corner and section of the set. We put a lot of effort and many meetings into that one shot. 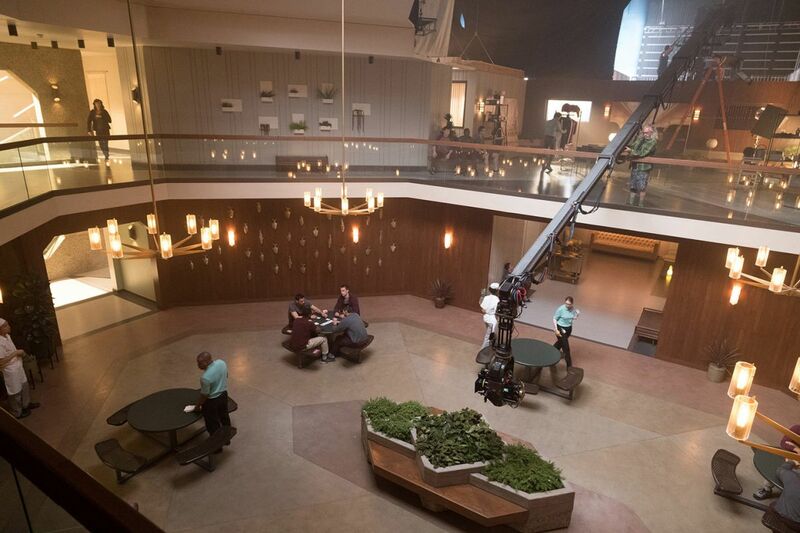 A telescopic crane fitted with a SpaceCam Oculus head is angled into position throughout the two-story set, which was designed by production designer Anastasia White and incorporates a large “skylight” in its ceiling. “When we designed the set, we knew to make that big skylight really important,” Campbell says. 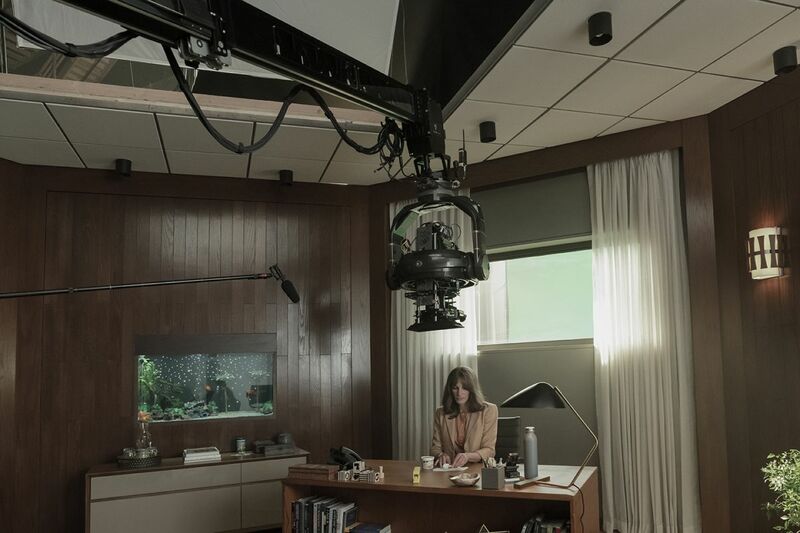 A Panavision Millennium DXL2 camera is rigged in an Oculus remote head for a scene set four years in the future, when Bergman works as a waitress and remembers little of her earlier experience as a caseworker. 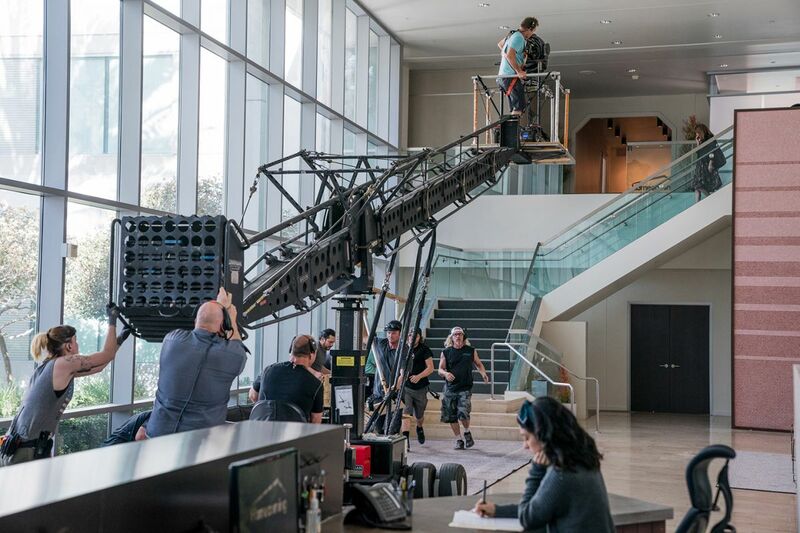 To follow Roberts as she descended the lobby stairs, the crew tracked a dolly onto a platform that had been rigged onto a crane, which then brought the camera down to ground level. On set throughout production, digital-imaging technician Robert Howie monitored and managed the camera signal from his DIT station, which included two calibrated 25" Sony OLED monitors, one calibrated 25" Flanders DM250 OLED monitor, and one Sony PVM-A170 OLED monitor, “and of course, a few Leader 5333 waveform monitors,” Howie notes. During shooting, he employed Pomfort LiveGrade Pro and IS-Mini LUT boxes to apply first a basic CDL, and then a proprietary LUT to serve as what Howie calls “a solid base” for instituting the color palette chosen by the filmmakers. Howie emphasizes that the idea was to limit the project to a single LUT, which was based on FotoKem’s film-emulation approach. “You can always make CDL changes and decisions as the project evolves for different scenes and different looks, but in the end the ‘base LUT’ stays the same,” he says. The LUT was a slightly adjusted version of one originally developed at FotoKem which mirrors Kodak 5219 stock. The camera is craned into position for a high-angle shot above Bergman’s desk. Esmail, Campbell and crew fine-tune a composition.